If you've been looking for a small project to try Tunisian Crochet, look no further! 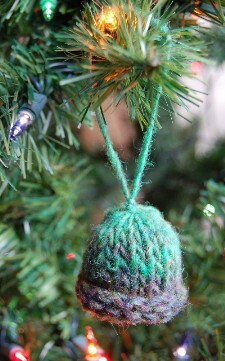 This cute little hat-shaped ornament works up in practically no time at all, with almost no shaping and only a few yards of yarn. It's even small enough that you don't need to buy a special afghan hook to make it, letting you test out a new technique without investing a lot of time or buying new equipment. Even if you never want to try it again, you'll have something to show for your efforts. You'd better watch out, though - I bet you'll be hooked!